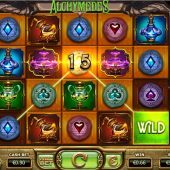 Alchymedes slot from Yggdrasil Gaming is based on the mythological art of mutating metals, not the acient art of downing lots of alcohol and becoming what is known as an 'Alchy'. At first glance the game reminded me immediately of the Dr. Watt's Up slot. So will all this meddling with metals lead to a nice stash of gold? Usually I would explain the basics then have a separate explanation of the feature(s) when reviewing a slot but in this case the odd mechanics of the game are all visible in-play and features are cumulative rather than triggered. So is it as mad as the proverbial Professor? There are 30 pay lines on a 5 reel and 4 row format, and the game pays both left-to-right and right-to-left, effectively making 60 winning lines for wins involving 3 or 4-of-a-kind. You start the game off on level 1 and the cumulative working is thus: any reel position that has any win on it turns gold and over the next 50-100 spins you should fill all positions. During this play there is a red multiplier counter on the right which randomly increases and this is important because the last winning spin that completes the level gets multiplied by that number. Wilds can appear anywhere and have no multiplier but expand in a certain pattern for example in a letter 'T'or 'L' shape. This pattern is randomly chosen before each level. There is also a random feature that may appear upon completion of the level. This may award either a cash amount (small) or bigger expanding Wilds for the following level or start the next level off with either a 2x or 3x multiplier for the red meter on the right. The one that you'd really want though is the 'increasing multiplier' as it raises your final win multiplier by 1x every spin for the next level. Given that this would take tens of spins to complete, therein lies any potential. You will however when completing any level get to choose either a better Wild pattern for the next level or a faster increasing multiplier. These are all reset when the levels are complete. The game has 200 levels and once you have completed them all at that particular casino you will get base game spins where any Wild pattern can appear and apparently there are over 15000 possible patterns! Your best 5-of-a-kind win is 16.67x stake and the lowest 2.33x stake so base game pays are low. Alchymedes slot is clearly innovative and it's nice to see Yggdrasil try a different game structure, especially as their sound effects and graphics are arguably second to none. There are unfortunately many negatives: Firstly, in my experience, players like a triggered bonus, and there isn't one. Secondly, what player likes to be tied to a slot whereby the potential is held back for an indefinite number of spins (in this case the level completion win with the accumulated multiplier)? For example on WMS's Super Monopoly Money you can cash the cumulative amount out when you like, and don't have to wait to see it. Then there is the 'compensation' allegation. On Yggdrasil's Vikings Go Berzerk many players have observed that when getting picture symbol wins to complete the Ragnarok Meter which triggers a decent free games round, at the point of needing one or two small wins the game 'dies' and the character wins seem to vanish and the temporary RTP drops hugely. I have to admit I noticed that when testing the game. Alchymedes slot seems little different when needing any small win in a certain position to complete the level and get the multiplier on it.